Italian etcher and painter. He is listed as being in Giovanni Battista Paggi s studio in 1627 and also studied with Giovanni Andrea de Ferrari and Domenico Fiasella before going to Rome. His work is known primarily through his etchings, printed in Rome and dated from 1636 to 1661. With few exceptions, Podesta s paintings, most of which are in France, and prints are in the style of Poussin and depict children playing amid classical objects in landscapes. The dedications on his etchings reveal his patronage and artistic circle. The etching after Titian s painting Worship of Venus (1636) is dedicated to Cassiano dal Pozzo (1588-1657), whose archaeological interests probably played a role in Podesta s artistic development, putting him in the circle of Poussin. Three etchings (1640) concern the pleasures of wine and are dedicated to Paolo Giordano Orsini II, Prince of Bracciano, whose inventories of 1655-56 show that he owned many paintings by Podesta, including two landscapes and seven small paintings of seafood. In a few drawings by Podesta there are features familiar from the etchings: contorted facial expressions, small twisting figures, patches of dark cross-hatching and an interest in still-life. Their precision matches and perhaps derives from Sinibaldo Scorza, whose prints may have helped Podesta to develop his skill in the medium. In 1650 Podesta became a member of the Accademia di S Luca in Rome, and a letter dated 1664 asking that he obtain a painting in Venice for Louis XIV suggests that his activity in Rome, France and Venice may have overlapped with that of Giovanni Benedetto Castiglione. Podesta s long life places him close to the lyrical Baroque spirit of Pierre Puget and artists in the Casa Piola in the 1660s. 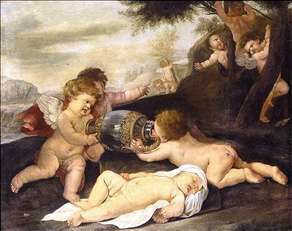 See more details about "Putti in a Landscape"